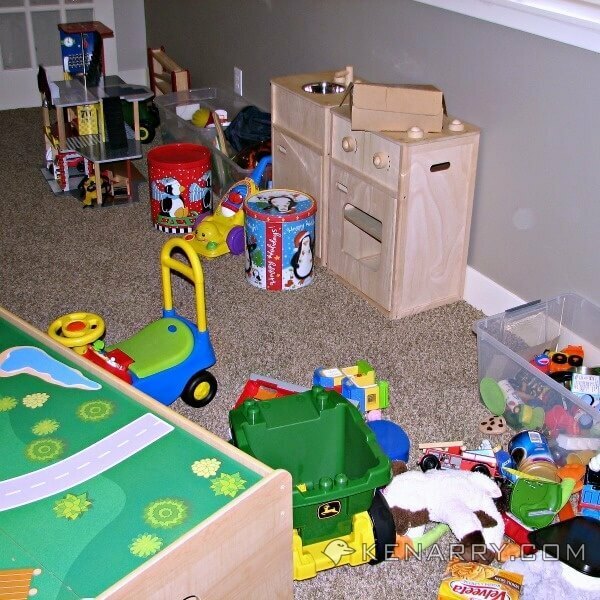 Are you overwhelmed with the clutter and chaos of toys in your home? 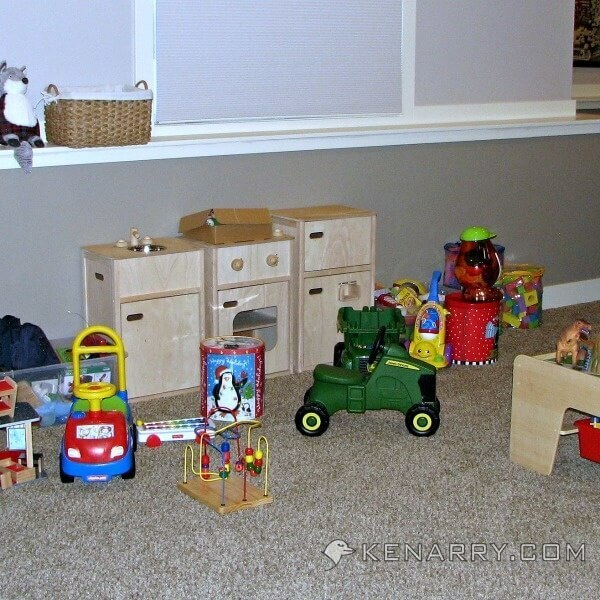 Tackle toy organization this spring with these ten easy tips to tame your toys. 1. Involve your child in toy organization. 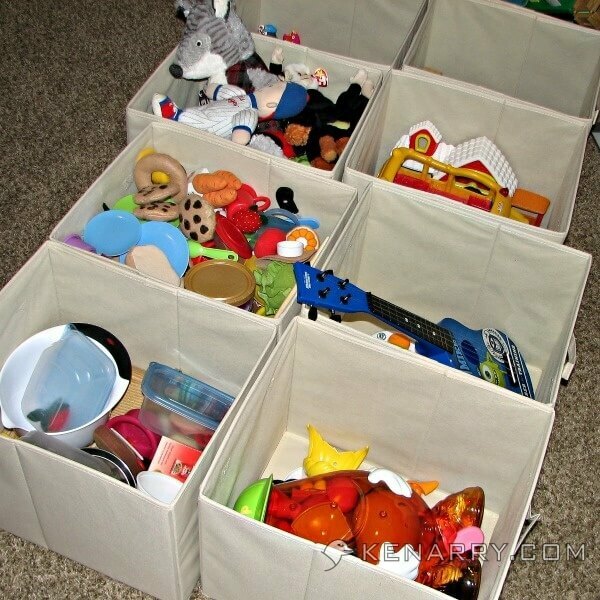 Set aside a time to tackle toy organization with your child. We find mornings are usually when our three year old son has the most energy and best attitude. Children naturally want to be helpers. Having children help with their toy organization gives them a sense of ownership over the process. It also helps to set expectations about how to put away their toys properly. Though it takes twice as long to get a job done with their help, the long-term benefits outweigh the length of time it takes in the short-term. We recently organized the toys at our house. We used it as an opportunity to talk to our three year old son about the importance of taking care of his things. We told him that includes keeping his toys organized, getting rid of broken toys and putting away toys he’s tired of using. If he and his younger brother were a little older, the conversation would also include why it’s important to share toys they’ve outgrown with another child who needs it. 2. Dispose of broken toys. Once we talked about the toy organization plan with our son, we started sorting through the mess of toys. First, we threw away or recycled any broken toys that couldn’t be repaired. We also set aside any toys that were missing pieces. If we didn’t find the missing pieces by the end of the toy organization time, we pitched or recycled those toys too. 3. Give away toys the kids have outgrown. Once the broken toys are gone, the next step is to create a pile of toys the children have outgrown. There are many great nonprofit organizations in your community who would love to give those toys to families in need. You may also have a friend with younger children who would appreciate them. This is a tremendous opportunity for your child to learn the importance of giving to others. As an alternative, you could also organize a garage sale or sell the toys as part of a large consignment sale. Doing so would bring in a little income to buy the next age level of toys for your children. Either way, the toys need to find a new home! 4. Put away toys the kids are tired of using. My friend, Katy, shared this great idea with me awhile back. When her daughter is tired of playing with some of her toys, she hides them away in a large plastic tub or tote. A few months later, she brings the toys back out of hiding. Her daughter is thrilled to suddenly have “new” toys she’d long forgotten. We tried this with our son for the first time right before Christmas. We bought two large totes at the store. We kept one empty and had him fill the other with any toys he was tired of. We told him we were going to put them away for a while. For the first few days, he asked about the toys, but soon he forgot all about them. Now four months later, when we organized the toys in the playroom, we reminded him about that bin. We brought out the second empty bin and asked him to fill it with toys he’s tired of using now. We then let him swap the newly filled bin for the bin of toys he put away before Christmas. You should have seen how his eyes lit up looking through the bin of toys he put away month ago. He was so excited. 5. Cycle new toys into rotation. When our sons get new toys for birthdays and Christmas, it’s overwhelming how generous their grandparents, aunts and uncles are. If I can, I try to hide away a few of the toys a day or two after the event. I reintroduce the new toys into the playroom every few weeks. This practice is especially helpful after Christmas. Half the time, they don’t remember all the toys they received at the family party anyway. The boys appreciate the toys more when they only have one or two new ones at a time. I also find having new toys to play with in January or February helps prevent cabin fever and winter boredom. 6. Buy shelves and bins to organize the toys. Toy organization must involve some sort of shelves or toy boxes to put the toys away. Our playroom is out in the open, so we prefer baskets or bins to hide the toys away when they’re not in use. It looks less cluttered than having toys stuffed or placed randomly on shelves or in overflowing toy boxes. Our local Costco always sells furniture during the winter months. For a few years, we’ve been eyeing the room dividers that have eight cube shaped spots and bins. When we got ready to tackle our toy organization problem, we finally picked up two of these shelving units for only $137.79 each with tax. They were less expensive than ones we saw online at Ikea. They were also higher quality than similar shelving units we’ve seen in local department stores like Target and Walmart. Plus the shelving units came with sturdy canvas bins in a neutral color to go with any home decor, so we didn’t have the added expense of buying those separately. 7. Teach your child how to sort their toys. Children love to sort, especially if you make it into a game. We let our son categorize his toys. We set out 8-10 of the canvas bins on the floor. I would hold up a toy, like a truck, and ask “where does this go?” He would say “that goes with these cars and trucks.” I’d hand it to him to put in a bin with the others. We did this over and over again until every toy was in one of the bins. 8. Label the toy bins. Next, we created labels for each of the toy bins using the category names our son chose. Our canvas bins have a slot designed for the label so we can easily change the labels as the toys change in the playroom. For younger children who can’t read, I think it would be great to include photos or clipart on the labels along with the words. I was in a hurry, though and skipped the step of searching for graphics or taking a photo that represented the category. Once you’re done with the toy organization and have them all placed in neatly labeled bins on shelves, take a picture. It will probably NEVER look this neat and tidy again. In an ideal world, each time the kids are done playing, they’d put all the toys away in the appropriate bin. Let’s be realistic though — that’s not going to happen. Their little friends will come over to play and help pick up toys. Your family will be in a hurry to go somewhere so toys will be randomly stuffed wherever a space is available. At some point, you’ve got to just be okay with the chaos. 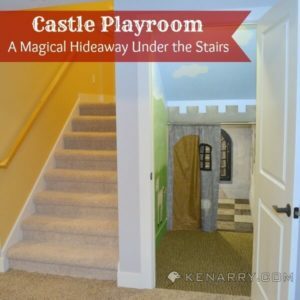 As long as the toys are hidden away in a bin when it’s time to pick up the playroom, don’t worry if it’s not perfect. 10. Make toy organization a regular habit. Once or twice a year, go back through steps 1-5 with your child to sort, store, purge and give away toys. I’d suggest tackling the toy organization in November to overcome the chaos before all the new Christmas toys come into play. Then do it again in April or May after the kids have been playing with them all winter. 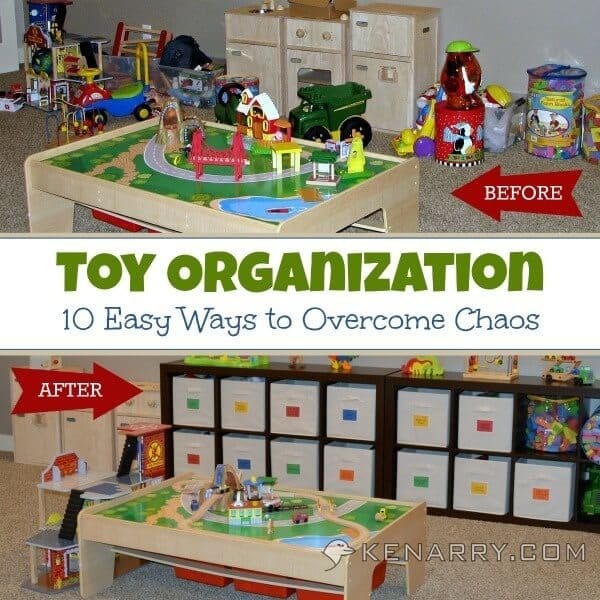 Have you tackled toy organization in your household? 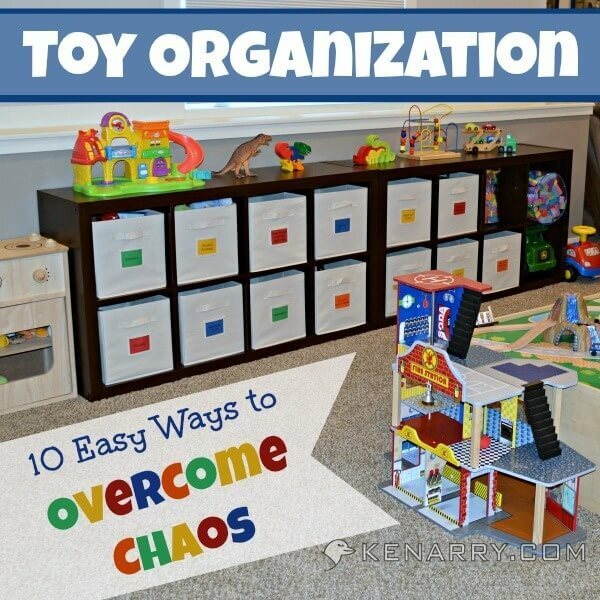 What toy organization tips would you add to this list of easy ways to overcome the chaos? Please comment below to share with our readers. If you’re looking for other tips like this, check out our Cleaning and Organizing Ideas board on Pinterest. Wow! So organized! My girls aren’t so little anymore. They are 18, almost 15, and 12. My 12-year old still plays with dolls a little, thank goodness but, now she’s old enough to organize her own things. This is very cool! I’m looking forward to my kids being old enough to organize their own things too! I have to remind myself, though, to cherish the special moments while they’re young too. Life just goes by too fast, don’t you agree, Laurali? As I was reading this, I heard the container of Legos just get dumped on the floor. Sigh! Maybe I should have him read it. Ha ha! Wouldn’t that be great, Audrey?! We haven’t hit the Lego phase here yet, but I’m already dreading all those tiny pieces everywhere. I can’t wait until my daughter is old enough to help me clean up. I get so carried away with cleaning and organizing her playroom and she just loves dumping everything out as soon as it’s picked up. 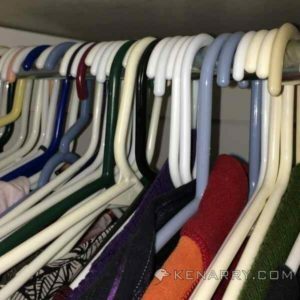 I love the bins, we have a similar system in our playroom, but I have a taller version and use the top shelf for pajamas and outside clothing for easier access. I hear you, Brittany! C2, our one year old just LOVES to dump baskets and bins of toys. It’s so frustrating when he does it right after you just picked them up! I’ve used most of these tips, but never thought of #5! We have a small space, so storing half of the toys in a bin in the garage makes a big difference. My kids love LEGO and we have a lot, so there is a designated LEGO area in the living room and they cannot leave it. All of the other toys stay in the bedroom, so it is fairly organized. Thanks, Keri! I was amazed at how well it worked to store a bunch of toys away and how delighted our son was to see them again months later. It’s like they were new all over again. LOVE your idea of having a designated LEGO area. Our boys aren’t quite to LEGO age yet, but I’m making a mental note to instill that rule when they are. It’s brilliant! This is awesome and timely for spring cleaning! I love your idea to get the kids involved and the one about cycling the toys. Our son only receives toys at Christmas and birthday because he gets so much from the family. I know what you mean, Rachel. It’s overwhelming how generous families can be at birthdays and Christmas. We hardly ever have to buy toys for the boys ourselves. Hope you’re able to get your kiddos to help with spring cleaning this year. Thanks, Lara! It’s hard to imagine not having all the toys around, but I bet that day comes quicker than I’d expect. I wish you could come to my house and do this for me. Great job and great motivation to tackle my kids toys/mess today. I almost think it’s more fun to organize other people’s stuff than it is to organize my own! Hope you had a productive day, Carmody! Oh my. Organizing the toys fees like a never ending task. *sigh* I think I just need to rotate them more often and limit them to certain rooms! Oh, Clarissa! I know what you mean. Toys, toys and more toys. It really is never ending. Love this post! I’m a former preschool teacher and professional organizer. Your tips are spot on! Involving the child is very important, as well as demonstrating the cleaning process (which is basically sorting and matching the toy with the appropriately labeled bin/basket/tub). 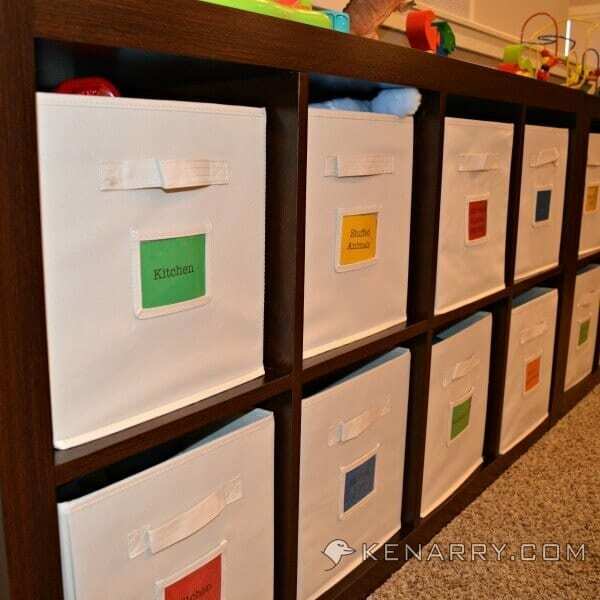 Labeling is the organizing secret of preschools and day care centers. Kudos to you for a job well done! Hi Nancy, I’m thrilled to hear we’re on the right track. It means a lot coming from a former preschool teacher and a professional organizer. Thank you so much for your kind words and kudos! Thank you so much, Sierra! I totally agree. 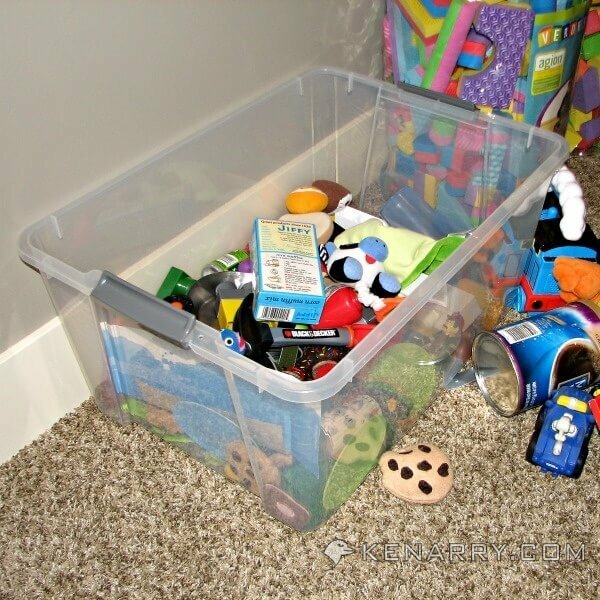 Having bins is so helpful for keeping the toys organized — or at least picked up off the floor!